Before I get started with posting a new drawing and story, I just have to get an apology out of the way….probably more to myself than you unless you also had expectations about how often I would post. Anyway if you did have expectations, I am sorry that I have been a tad absent lately (A TAD??) How about only posting a couple of times in around six months! I know! Really that’s so disgraceful. Even though I am apologizing, I wish you to know that I lay it entirely at the feet of my recalcitrant inner child, or maybe my rebellious lazy inner teenager. Anyway the job hasn’t been getting done. So as the stern disciplinarian that I am …no? …..No, I didn’t buy it either. You see the problem is exactly that. The inner young one says I don’t wanna sit at the computer ! I want to go play! And being a pushover, I give in. Well no more. Times are changing! …..at least I think they are. This is Aurelia. And as you can clearly see she isn’t what you would typically think of as a witch. Girl’s got style. No old haggy black threads for her. The only concession to witchly fashion that she makes is in her accessorization. She carries the typical broom, which I will remind you is also her ride. I’ve heard through the grapevine that she’s been talking to some decorative artisan about bedazzling her broom with rhinestones and maybe a few semi-precious gems. A bit of gold here and a bit of sterling there. It will be quite impressive, but I can’t help but wonder how comfortable it will be. It would not be the first time that fashion got in the way of comfort. I think you ladies know of what I am speaking.. er writing. If you are used to seeing witches with ugly old black pointy hats you will notice the exquisite chapeau that Aurelia is sporting. It’s a lovely lavender hand felted model adorned with exotic bird feathers, silk flowers and black and white striped satin ribbons. Rumor has it that she has a different hat for every outfit. Well I could go on and on about the rest of her ensemble but I want to get to the really exciting part which is the fact the other witches are starting to sit up and take notice. Appointments are being made for manicures and facials. And very fashionable boutiques that cater exclusively to the witchy set are starting to pop up here and there. And you know what that means?! When a person starts to feel good about how they look they start to feel and act less crabby. So for us that means maybe a few less instances of being turned into toads and worse. I for one, am very appreciative of Aurelia’s trendsetting style revolution. The witches arriving for the annual Witches’ Ball were just like any human, which they were or at least had been, and they enjoyed getting together once a year to dance, drink, and generally let off steam. Most of the year they lived a rather solitary existence except for the occasional human who came seeking a love potion, a fertility charm, or rarely some kind of hex. Only the darker witches practiced those arts, thank goodness! And just like humans they would catch up on the latest gossip and goings on in the witch and wizard community at large. They also would talk about others within earshot of the victim of the gossip, especially if jealousy were involved. Of course the aftermath of the Witches’ Ball was the same as any party, where the liquor has flowed freely. Some witches and wizards were able to fly home, however wobbly they were, but others could still be found at sunrise hanging around by the brooms. Fortunately a drunk witch who takes to the air in an inebriated state only risked harming others by falling on them. Of course the wise witch would spell their broom to remain under them no matter what. Which explains why you’ve probably never seen a news report about a oddly dressed weird person falling out of the sky. Of course most wizards didn’t ride brooms, preferring to disapparate. This is its own challenge when you’ve drunk a bit of the bubbly. One might just reappear in the middle of a wall, or just as detrimental to one’s health, leave bits and pieces behind. I was watching a re-run of the Hercules show, the one with Kevin Sorbo, and this old man came on the TV. I loved his eyes. Loved the crinkly wrinkles around them. So I ran and got my sketchbook and started to draw him. Unfortunately he was only on the screen for a few minutes and then gone. So I continued to draw and he turned into an old woman (I don’t know why, it just happens…). She then became a witch and I started to wonder why was she so sad? Yeah I know what you’re probably saying, “You drew her that way dummy!”. But artists have as little control sometimes over their subjects as writers do over characters. They just write or draw themselves that way. I digress. So I asked the old woman why she was sad and the answer that came was because she loved children. Oh take that smirky look off your face. She didn’t love eating them. She wasn’t that kind of witch. She loved to be around them. The problem was that they too thought that she would eat them and so they always ran away. Too bad for them because she would have given them gingerbread, cookies, and milk and told them wonderful stories about her childhood adventures as a witch. In other words, magical creatures, maybe even fariy kind. It was only in Shakespeare’s time that the three women were described as ugly, dirty, old hag witches. At the time he wrote his masterpiece, there was great superstition and fear around witches and the gift of prophecy. Those who can see the future are often blamed for making happen what it is that they’ve seen. The people that they predict the future for, often don’t want or can’t see that their own actions are leading to outcome in their future. A seer simply follows the lines into the future and tells what they’ve seen.Is the future indelible? Is it written in stone? Why have someone tell you your future if you can’t do anything about it? The truth is that, at each and every moment in our lives we shape the future with our thoughts. feelings and actions. If you don’t like what you’ve been told then change your thoughts, and more importantly, your feelings, so that your actions lead to the outcome you that you do want. And please don’t blame the messenger! In my painting, the woman on the left looks inward to see what thoughts and feelings of the past that have inspired actions. 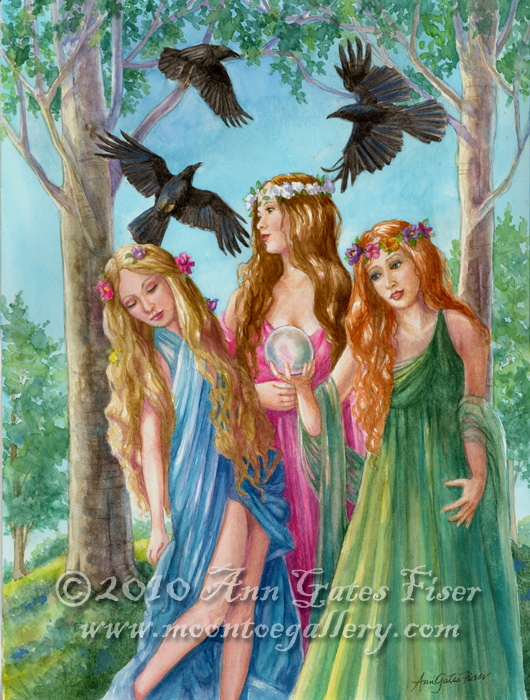 The one in the middle looks at those past actions that have led to this nexus, and finally the one looking into the crystal ball follows the lines to the probable outcome in the future. * Holinsheds Chronicles of England, Scotland, and Ireland, is a collaborative work published in several volumes and two editions, the first in 1577, and the second in 1587.